Duncan was born in the rural community in Vihiga where he still lives today. His father died when he was six years old. His mother struggled to take care of her children alone. Because of that financial pressure, Duncan did not go to high school and instead began working from a young age. He started off doing casual work in hotels as a cook. He then tried his hand at hawking groundnuts in the market. He moved to Kericho and worked as a tea picker and then to Mombasa where he stayed with relatives and again cooked in a hotel. There he was finally able to save some money and planned to save enough to go back home and take a driving and mechanic course. While doing the course back at home he met Stella, and soon she was pregnant with their first child. He picked up casual work outside of his classes to begin taking care of his new family. Once he finished the course, he landed a driving job. Now he was earning more than they needed to make ends meet. He managed to build a permanent house for the family and to buy a young cow. Once that cow was grown, he realized he could sell it, buy a motorbike, and enter what he saw as the more attractive world of self-employment. When we met him, he had been self-employed as a boda boda driver for the previous three years. In order to make a good living, he rides late into the evening when he can increase the fares for passengers’ small trips. This increases his revenues, but isn’t without risk. During the Diaries year, he was arrested three times by police for driving at night and needed to pay bribes averaging KSh 6000 each time. Overall, though, his business was going well. Through it he bought household assets and a cow. His children were all able to study in a nearby private school. Stella was also in business. She brewed and sold illicit alcohol, changaa, wholesale. The business was profitable and also allowed her plenty of time to be with the children and to take care of household cooking, cleaning, and tending their small farm. She made her own choices of how to spend her money on her business and other projects. 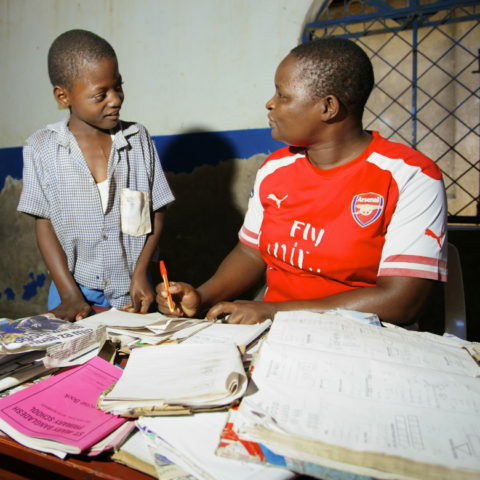 Duncan was responsible for paying for school fees and groceries, which he covered by giving Stella KSh 150 every day. I’d rather put my money where I can see it, rather than in a bank where I cannot see anything. To save and supplement his income, Duncan was always rearing a cow or two at a time. 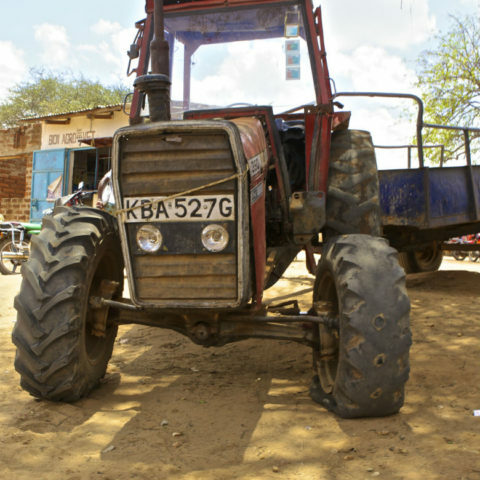 He told us, “I’d rather put my money where I can see it, rather than in a bank where I cannot see anything.” He would go on his motorbike to buy special feed for them at KSh 700 every week. Once the cow was big enough, he would sell it, use some of the money to buy a young calf, and devote the rest to his projects. This came in handy when his motorbike needed an upgrade. His old bike was having a series of breakdowns, so he sold it off for KSh 37,000. He meant to hold onto that money, but much of it was quickly spent. He wasn’t quite ready to sell his cow, but he felt he had no choice. 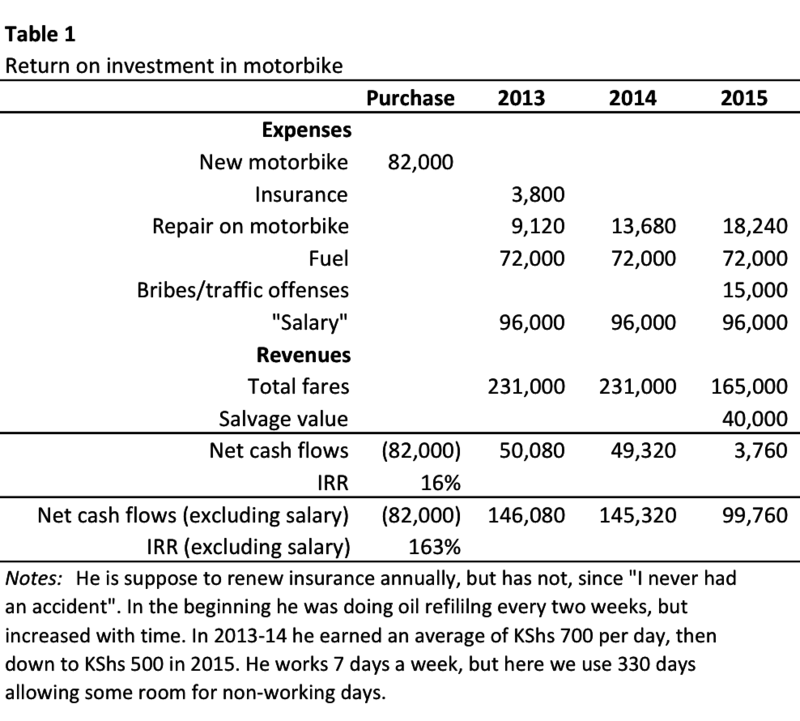 He sold one for KSh 44,000, Stella gave him KSh 16,000 from her ROSCA payout, and he added KSh 22,000 left from the sale of the old bike and bought a new one. With the new motorbike he was back in business. “It’s now time to make money. Once it gets old I will use a lot of money for maintenance and get less profit,” he said. While the two liked saving in cows and in chamas, they learned the hard way about the risks of saving in the house. In May 2013 the household was raided by police officers looking for brewers. Stella managed to escape but Duncan was caught. The police destroyed their brewing equipment and confiscated 20 litres of the brew, worth KSh 2,800. Duncan was told he would also need to do community service, but he bribed another officer KSh 1,000 to drop the case. After the officers left, Stella and Duncan realized that they had stolen KSh 15,000 of Duncan’s savings under the mattress and KSh 2,000 of Stella’s in her purse. Duncan was hoping to use that money to buy a calf. Stella’s money was earmarked as her monthly ROSCA contribution. Both were upset, but had little recourse. They couldn’t complain about the theft without confessing to their illegal business. Asked if he would still save under the mattress Duncan said, “I am thinking of opening a bank account.” He never did. Soon after, Stella borrowed brewing equipment and got back to business. On Duncan’s next chama payout, he bought the calf he had been saving for in the house. Both Stella and Duncan were active chama—mostly ROSCA—users. “They help me save money that I would otherwise use carelessly,” said Duncan. They each make contributions from their own businesses, but help each other keep up with contributions when the other is unable. For example, during the 2015 government crackdown on brewing, Stella’s business slowed for a time and Duncan took over her shares. When she got her payout, she gave a big part back to her husband. When we visited the couple two years after the close of the Diaries, they told us their economic lives had improved because their businesses had grown. Those chamas clearly played a big role. At the time of the Update, Stella was in one group and Duncan in two. A third of their combined income was going into the chamas every month, helping them make some investments that increased their earnings. Duncan, for example, was in a group that increased their contributions from KSh 500 to KSh 1000 per week. 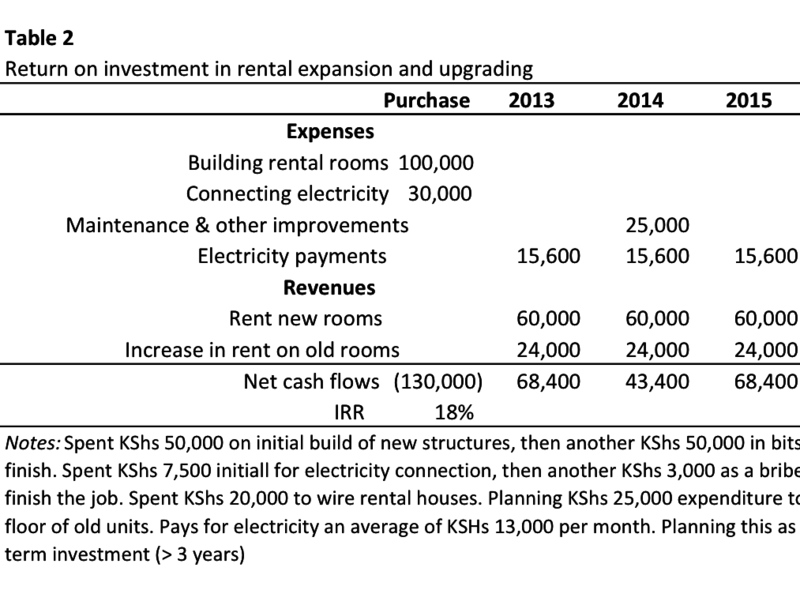 On his turn, he got KSh 64,000, which he combined with some of Stella’s group payouts to build five new rental rooms. Over time he added more from his income to finish them nicely. Duncan also used part of his payout to buy a cow (KSh 25,000) and apply for an electricity connection (KSh 7,500). The couple now has ten rental rooms. Now that they have electricity and cement flooring in all the units, they can charge KSh 1000, up from KSh 600 during the Diaries. The rooms are nearly always occupied. Stella has used her payouts to buy new furniture, including a new set of seats and cushions for KSh 23,500. The two also accomplished a long time goal of finally paying Stella’s dowry. Duncan took her parents three cows that cost him KSh 30,000 and also gave them KSh 4,000 cash, again using funds from a chama payout. 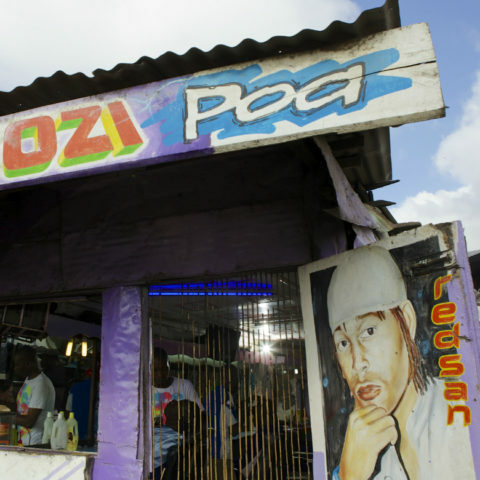 Stella’s savings has also helped her business grow, in spite of the government directive to stop illicit brewing. In fact, the crackdown caused a shortage in the market of brew made with “compressed sugar” rather than molasses. 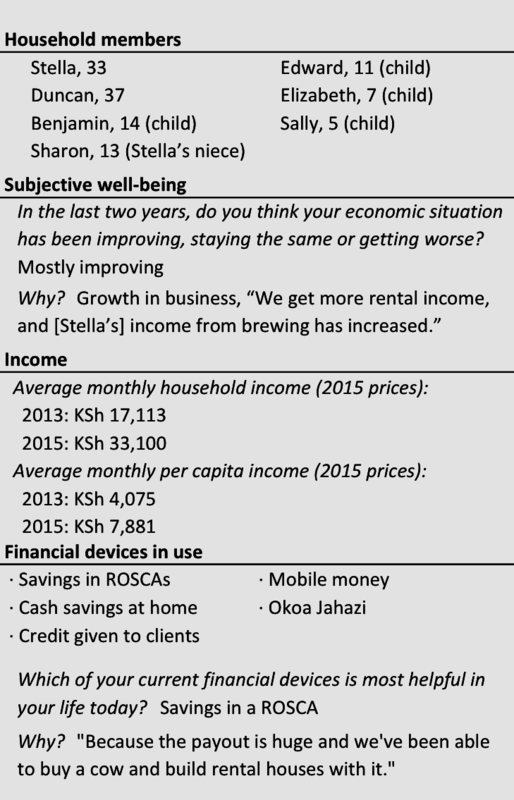 When Stella got a chama payout of KSh 8,000, she used KSh 6,000 to invest in stock of this compressed sugar. Though more expensive than molasses, the returns were higher, and the market for this kind of alcohol had expanded as competitors were driven out. In an attempt to evade police, she moved her brewing business to her parents’ home away from an area where there are many brewers and frequent raids. Their disciplined savings in groups and diligent investing has nearly doubled their Diaries-level income. 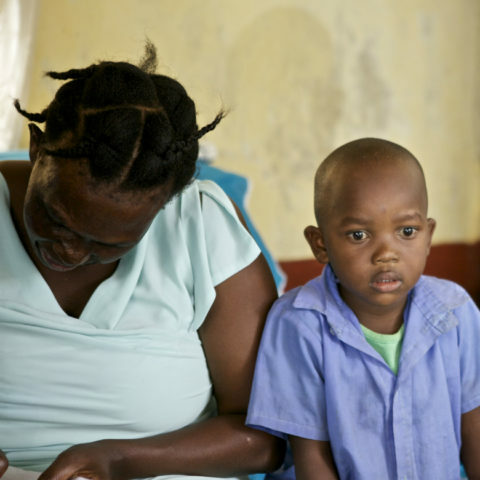 Duncan and Stella are working as hard as they can to put themselves in a position to be able to afford good schools for their children when they reach secondary school. “I want my children to be educated, not like me who dropped out of school,” Duncan says. Their eldest child is now in class seven, and the youngest is in kindergarten.